When it comes to website designing, one of the most important things for a designer is to choose the right color scheme. This is not as easy as it sounds, as you have to keep a number of things in mind. But this irksome process of color selection has been made a little easier– thanks to all the great tools present out there. If you like This Article, You might be interested on web design Tools, Designers Tools, Identify Unknown Fonts and Image Optimization Tools. This one is a really simple and handy online tool that will let you create a color scheme. All you have to do is to upload a picture and then the tool will itself suggest colors to use with the picture. Downloading the Adobe swatch of the suggested colors is possible. ColorExplorer is a bit more comprehensive tool that boasts various color tools. The color picker will let you choose a color and then view its variations. Color libraries are also present and using the color matching tool for creating a palette is also possible. As the name suggests, this handy tool lets you ‘grab’ colors from a photo that is present online. All you have to do is to simply enter the URL of the photo and then it will display which colors have been used most in the image. ColoRotate has a nice collection of color schemes. Browsing through the schemes or creating your own with their great 3D tool is also possible. You have the ability of using it right away in Photoshop and Fireworks with the ColoRotate plugin. This tool allows you to set one color in the scheme, and then it will set the other matching colors all by itself. You have the ability of trying various kinds of color schemes such as analogous, complementary, triadic and tetradic etc. As the name suggests, this tool lets you select the kind of scheme you want to use ( for example: mono, complement, triad, tetrad, analogic, or accented analogic). After that you can just simply set one of the colors on the wheel and the other colors will also set. This will let you produce a suitable color scheme. ColorSchemer boasts a great library of color schemes made by their users. You have the ability of browsing by submission date, rating, or number of downloads, or you can also search using a keyword. Kuler is a tool from the household name Adobe. 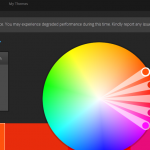 It features a huge library of user-submitted color schemes. You have the choice to view the color schemes online or download them and use them in Adobe Creative Suite products. Color Spire yet another handy tool. Simply choose a starting color and then it will itself suggest a palette of colors that can be used with it. This tool also shows a basic preview as to how the colors would appear on a sample website layout. This is an awesome tool that boasts a humongous collection of about 2 million color palettes made by its users. You have the ability of browsing through palettes by submission date, rating, views, and comments, or you can also search by keyword.